Thank you for your interest in Carrie Bloomston. If you have questions about Carrie Bloomston, her creativity workshops or licensing opportunities, please contact us directly via email at info@carriebloomston.com or by using form on the right. 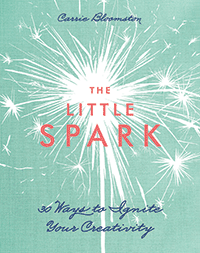 To purchase Carrie’s book The Little Spark–30 Ways to Ignite Your Creativity for your store, please contact Stash Books/C&T publishing or your sales representative or distributor. Contact Windham Fabrics or place an order with your sales representative. Please contact Interweave or place an order with your sales representative or distributor.